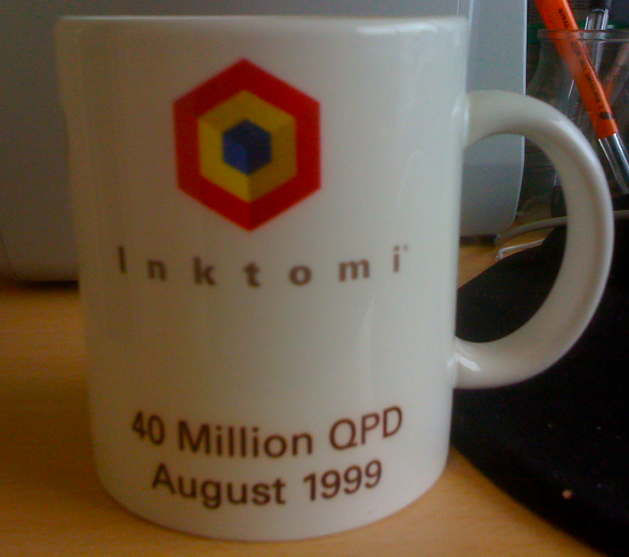 On March 20th, 2000 Inktomi had a market capitalization of 25 billion dollars. As a relatively early employee, I was a multimillionaire on paper. Life was good. In the next year and a half the stock went down by 99.9%. In the end, Inktomi was acquired by Yahoo for 250M. What happened? Among other things, Google. Grab some popcorn and enjoy this story. Inktomi was the #1 search engine in the world for a while. When I joined we had just won the Yahoo contract, and were serving search results for HotBot (there is still a search page there!) At first I worked on developing crawling and indexing tools written in C++. Our main goal at the time was to grow our index size, and at the same time to improve relevance. It became clear that as our document base grew, relevance would play a more important role. For ten million documents you may be able to filter out all but a handful of documents with a few well-chosen keywords. In that case any relevance algorithm would do; your desired result would be present in the one and only result page. You wouldn’t miss it. For a billion documents however, the handful would become hundreds or thousands. Without a good relevance algorithm, your desired result might be on page 17. You’d give up before getting to it. At first we were using a classic tf-idf based model, enhanced by emphasizing certain features of pages or urls that correlated with “goodness.” For example, yahoo.com is probably more relevant to the query yahoo than yahoo.com/some/deep/page.html. We thought shorter urls were better. Of course this query was very popular, so spammers started creating pages stuffed with the word Yahoo. This was the beginning of an arms race that continues today. Back then we were the main target because we processed more searches than anyone else. Yahoo had been complaining to us about not being result #1 for yahoo for a while. We fixed that special case, but we couldn’t do the same for many other sites or pages. In 1999 Google was gaining popularity because they were solving exactly this problem. We didn’t perceive them as a threat yet, but we did realize that we had to do our own version of PageRank. I was assigned to that task. Doug Cook built a tool to quickly measure the relevance effects of algorithmic changes based on precomputed human judgments. For example: it was clear that Yahoo.com was the definitive result for the query “yahoo” so it would score a 10. Other Yahoo pages would be ok (perhaps a 5 or 6). Irrelevant pages stuffed with Yahoo-related keywords would be spam, and humans would give them a negative score if they showed up for that query. Given ten results and a query, we could instantly evaluate the goodness of the results based on the human rankings. We had a sample corpus of links and queries for which we could run this test as often as we wanted, and compare ourselves against Google. We did this for months until it became clear that we were “as good as Google.” Our executives were happy. Despite our relevance being so great, there was one huge red flag: engineers at Inktomi were starting to use Google as our search engine. Our executives tried to stop us from doing it, just like Bill Gates reportedly banned his kids from using Apple products. I thought about why I was using Google myself, and I’m sure it’s obvious to everyone now: the experience was superior. Inktomi didn’t control the front-end. We provided results via our API to our customers. This caused latency. In contrast, Google controlled the rendering speed of their results. Inktomi didn’t have snippets or caching. Our execs claimed that we didn’t need caching because our crawling cycle was much shorter than Google’s. Instead of snippets, we had algorithmically-generated abstracts. Those abstracts were useless when you were looking for something like new ipad screen resolution. An abstract wouldn’t let you see that it’s 2048×1536, you’d have to click a result. In short, Google had realized that a search engine wasn’t about finding ten links for you to click on. It was about satisfying a need for information. For us engineers who spent our day thinking about search, this was obvious. Unfortunately, we were unable to sell this to our executives. Doug built a clutter-free UI for internal use, but our execs didn’t want to build a destination search engine to compete with our customers. I still have an email in which I outlined a proposal to build a snippets and caching cluster, which was nixed because of costs. Are there any lessons to be learned from this? For one, if you work at a company where everyone wants to use a competitor’s product instead of its own, be very worried. If I were an executive at such a company I would follow Yoda’s advice: “Do or do not. There is no try.” If you’re not willing to put in the effort to compete, you might as well cut your losses (like Google did with Buzz, for example). Discuss on Hacker News if you please. IIRC, we had a network flow algorithm that was similar to PageRank, but it wasn’t the most useful feature. I remember a point where we discovered that the anchor text feature implementation had a bug, and correcting it led to a huge improvement in relevance, replicating Google’s results in some cases. Since then I’ve believed that PageRank was a bit of a misdirect, and anchor text was Google’s real secret sauce in the beginning.Another big advantage Google had through their front end was that they kept it ad-free for a long time, while other sites were under pressure to monetize. IWon was the worst, blinkiest offender, but every search engine was cluttering their front page with flashing banner ads. When Google finally did introduce ads, they were small bits of text that didn’t try to distract you from your search. Interesting writeup – particularly the bit about management trying to ban you from using Google’s products. That’s when you know the ship is sinking. Google seems invincible right now, but I gotta say that they’re on the edge of not mattering as much either – they have a weakness in the most important thing in the decade, social media. I think that the idea of getting this structured data is what is so appealing to Google and why they’re putting so many resources behind Google+. Without access to structured social data, Google can’t continue to refine their search experience further. With access to this social data, Facebook has a legitimate shot of competing in search by using this social data to fuel their search experience. Facebook has captured the attention of the popular culture in addition to businesses: look at how many active users Facebook has, look at how many big brands are promoting their Facebook pages in their TV commercials, look at how many companies their are at http://www.buyfacebookfansreviews.com that do nothing other than promote Facebook pages…Facebook is really on the right track here even if they deserve a bit of criticism over some of their features. I think that the reason that Facebook is worth well in excess of their $100 billion IPO is that they have the potential to dominate search, ecommerce, and other major fields. But this market is so big and valuable that I think there’s room for other players to get involved here and take some risks and chances that big companies like Facebook and Google won’t take. @ccurrivan Hi Chris! I agree with you, anchor text was the breakthrough improvement. PageRank made it harder to game, and then the arms race continued.iWon… I remember that :)@elladstep: I wonder what’s the internal policy at Google about Facebook usage. I’m sure FB doesn’t worry much about their employees using G+. I disagree about not using the competitors stuff. I already know how my stuff works. The only way I can find out about them is by using theirs. When I see everyone using only their own products, I think “this place is like Microsoft”.Most of the big search engines discovered anchor text around the same time. I remember seeing Infoseek ESP demo’ed the first time. I think snippets are really about explaining the engine’s decisions to the user and building trust. If I see my words, but it is clear that the page is really about something else, I might forgive the silly computer. But if I see some wonderful abstract that says nothing about my search, the engine just looks wrong.I came in with the Ultraseek acquisition and rode the stock from $120 down to $0.24. We did sell a chunk at $60, but the options were under water after that, especially when we got into “shares per latte” terrritory. Great start for the book, Diego! Inktomi missed production deployment of the release that used frequency in anchors by 1 month. In July 2000 Yahoo switched to Google as a search backend. We had a prototype of anchortext only search engine running in November 1999 with index of 25M URLs. It took good 9 month to push this improvement into production, and it was too late. Google won the biggest search account in history. I think you underestimate how interested people might be in a book about your experiences. Sounds very interesting to me. Make it a Kickstarter project and gauge interest and if it’s there, do it! Nice article. Very interesting read. It seems like the Inktomi managers did let it fall once their engineers started using Google search. That says a lot. F.e., while I’m still comfortable with Google services, nowadays I more often use the new DuckDuckGo just because it makes it a lot easier to get very quick super relevant results. Just curious, the link for ‘new ipad screen resolution’ in this post is: https://www.google.com/search?ix=aca&sourceid=chrome&ie=UTF-8&q=domino+pizza+…&gs_nf=1&tok=DBTJEp2_3oW1F2ietDMecQ&pq=ipad%20screen%20resolution&cp=1&gs_id=5w&xhr=t&q=new+ipad+screen+resolution&pf=p&safe=off&sclient=psy-ab&oq=nipad+screen+resolution&aq=0&aqi=g2g-b2&aql=&gs_l=&pbx=1&bav=on.2,or.r_gc.r_pw.r_cp.r_qf.,cf.osb&fp=8316e992ae23057e&ix=aca&biw=1363&bih=647.Why does it include domino+pizza+phone+number?Thx. Nice catch! Because it's the first example I tried when writing the post, but the results I got didn't illustrate the point so well. I guess that because I disabled history with Google (or for some other reason), they are sending my previous query as a parameter in the GET request. Make that five copies – I’d buy one! Really interesting. I and my friends in Japan will buy if that would be a book! I had evaluated web search engine as a product manager of FE side. I remember I had asked Doug about some issues including anchor text and snippet. I didn’t know such a backgrounds. Diego,Thanks for capturing the train of thoughts that seem to run through my head almost daily. Lots of lessons to learn from that experience. Although it is easier to connect the dots in the rearview mirror that it was looking forward at the time, There were some clear lessons about not forgetting the actual end user (which is not always your customer), using a single metric as a proxy for user experience, obsessing about a competitor and trying to get big instead of great. Thanks Troy. Your comment sums it up really well. I also worked at Inktomi, and I think I remember you.You left out the part where Inktomi execs made the net eng team block access to GOOG for awhile at the office, and how Yahoo skillfully destroyed Inktomi by switching off Inktomi to Google, and then strung Inktomi along for months saying they’d return to Inktomi if only Inktomi would add certain features.Inktomi wasted enormous amounts of engineering effort while other clients like MSIE switched to different search engines. Yahoo continued to string Inktomi along until the stock price fell far enough for a takeover, which is exactly what they ended up doing. I agree with your post.Very enlightening to see what search engineering thought of the situation at the time. I wrote a blog post about it myself a while back: http://www.andysalo.com/2010/05/18/value-prop-vs-executive-team-a-common-vc-m… I was on the Traffic Server side of the house, first in sales then PM. I remember the last year or so at Inktomi as things were falling off a cliff. Painful.At the end of the day Google had a built a better mouse trap. As you say, the user experience was better. Completely agree that the eye was taken off the ball. Lessons learned. Makes you wonder “if only” we had a user facing, clutter free website, and some of the enhancements you highlighted, what would have happened. Great history lesson Diego. Like Troy, I think about this stuff daily. There are far too many lessons to be learned from the the events following March 20, 2000, many of which were born long before that. As a business guy, I am amused by reading your summary of the technical issues, and interaction of those with problem solving on the business side. Those issues have been less in the forefront of my recollections (for no reason other than my own focus) than two key business decisions that seemed, in hindsight, to be horribly wrong. First, was the decision not to permit paid-inclusion results because of a belief (which I think was genuine at the time) that doing so would turn off users (not our customers, but the ones searching). And second, not to buy Google early, when they demonstrated traction and INKT was strong currency. Definitely, there was a very complicated web of factors, which so many have pointed out above. Thanks for sharing the story. It is a great read, if only for us alumni.PS: I thought about writing that book a number of years back but thought you were right about how many copies would sell. not really relevant, but going down by 99.9% would be a going down by a factor of 1000, right? Seems like 25B to 250M is a factor of 100, so 99.0%? The stock peaked at $240 and bottomed out at $0.24. It recovered to about $1.60 at the end. I worked at Inkomi after it purchased Fastforward Networks which was a Live Media startup that was making money but after about 2 years of being at Inkomi and seeing the writering on the wall I left and could not believe poeple stayed, I have never worked for a company that requried me to go to a full day meeting on the who and what the company is and still come out wondering what the conpmay does other than just buy companies and have no idea what to do with them. Great summary of the problems in search. I was in the East coast office at the time and knew we were in trouble when I heard Peterschmidt say “…And I’m tired of hearing about how great Google is…”, but then couldn’t articulate either how we were actually better or how we were going to beat them. Ow, saw this only now – good times indeed back then. From my perspective, the company was betting on building virtual network infrastructures and content delivery platforms on top of physical network layers – caching was going to be the cash. Sales folks got incented strongly to sell those products, we in search suffered the “we-have-all-the-customers-we-can-get-why-should-we-invest” attitude. The Internet bust around 2000/2001 was enough so that physical networks could handle all the traffic so that Inktomi network products were no longer required. And by that time Inktomi had passed up the opportunity to acquire Google (yep!) and GoTo (yep again). No to say I did not enjoy booting Google out of a couple of customers (big UK media, web.de,…..).